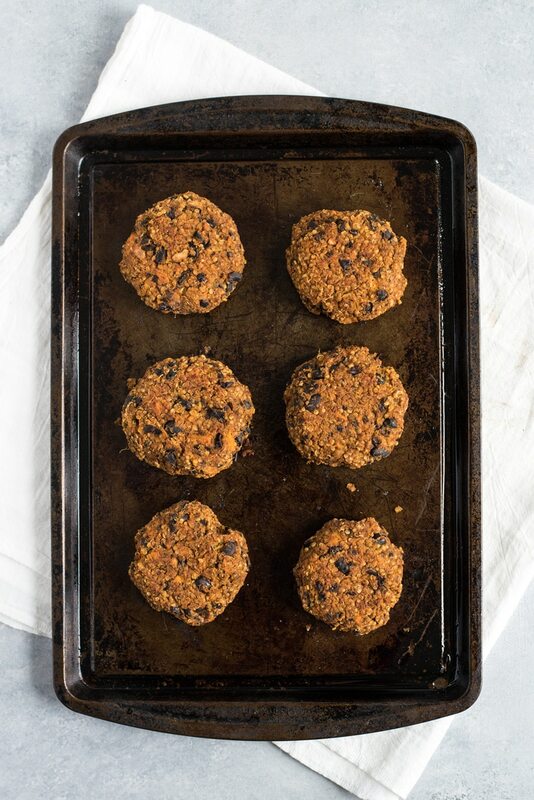 This black bean burger recipe is made with quinoa, sweet potatoes, black beans and spices. No eggs required! It’s gluten free, vegetarian and vegan. I LOVE a good veggie burger. 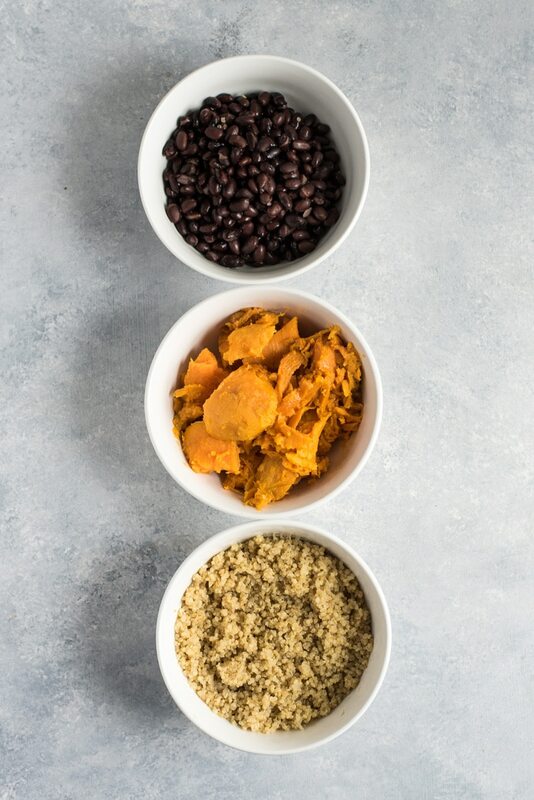 Especially when it’s filled with some of my favorite ingredients like sweet potatoes, quinoa and black beans. Can’t get much better than that. Oh wait – yes, it can. Add a huge shmear of chili lime mayo and NOW it can’t get any better. ? John and I have greatly increased our intake of beans the past few weeks. He’s been completely immersed in all things Tim Ferris (of The 4-Hour Workweek and The 4-Hour Body) and has begun following some of his nutrition and exercise recommendations, of which includes incorporating more beans into your diet. Being the Mexican that I am, I’ve been totally supportive of that decision. Beans have always been a part of my life. Growing up, my parents had beans available at every. single. meal. It was usually pinto beans, but occasionally they had black beans when they felt like branching out. Now the way they served the beans wasn’t fancy or revolutionary – it was either cooked beans in a broth with onions and spices or mashed refried beans. While those ways of serving beans are still two of my favorites, I’ve been experimenting with different ways of eating them in my day-to-day life. 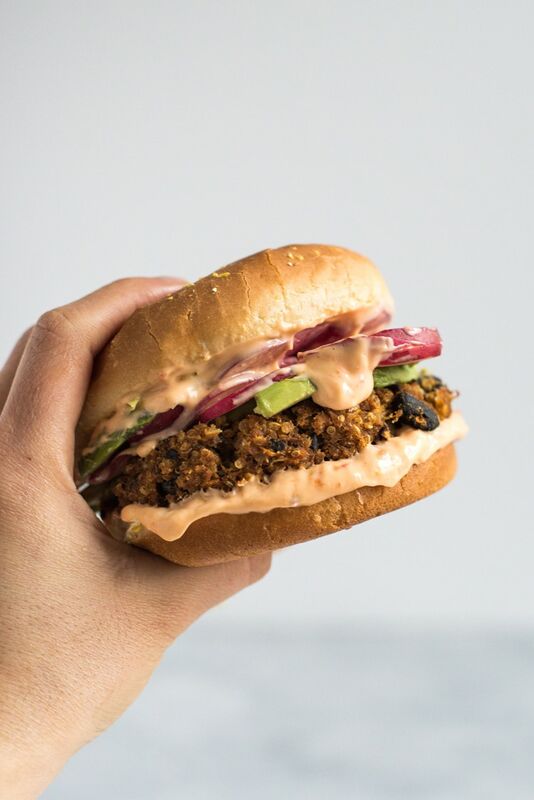 And that’s where this Sweet Potato Black Bean Burger comes in. 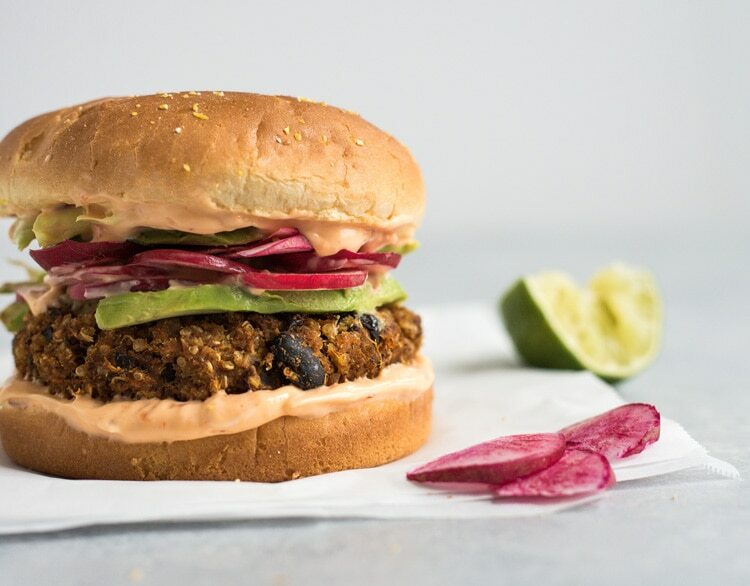 Made with quinoa, sweet potatoes, black beans and spices, this black bean burger is gluten free, vegetarian and vegan. No eggs are necessary to bind the patties together. The mashed sweet potatoes and black beans do all the work. And the quinoa? 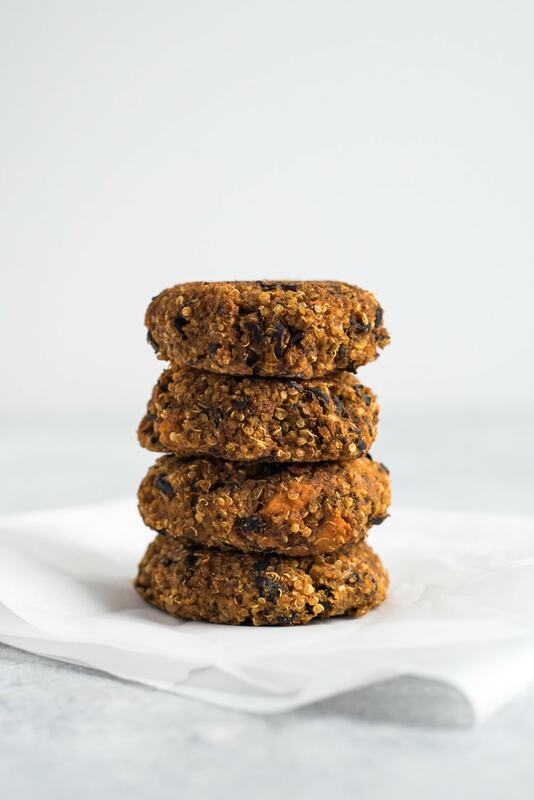 It’s gives the black bean burgers a nice texture and adds a bit more protein to help with the satisfaction factor. To make it even better, I whipped up a Chili Lime Mayo that’s easy to make and only requires a bowl and a fork. All you have to do is mix together some store-bought mayonnaise, chili garlic sauce (like this one) and freshly squeezed lime juice. It’s savory, a teeny bit spicy and has a touch of acidity that helps bring out all the flavors of the black bean burger. Seriously the best condiment ever. Cook sweet potatoes in 400 degree oven, cut side down for 30 minutes. While the sweet potatoes are baking, make the chili lime mayo. In a small bowl, mix together the mayo, chili garlic sauce and lime juice. Set aside. In a small bowl, add salt, onion powder, garlic powder, chili powder, oregano, cumin powder and black pepper. Mix together and set aside. In a large bowl, add black beans and cooked sweet potatoes. Mash until consistency is only slightly chunky. Some beans will be completely mashed and others will not. This will help create a nice texture. Add in cooked quinoa and spices. Mix together with hands and form into 8 burger patties, about 1/3 cup of mixture each. Place burger patties on a large baking sheet covered in parchment paper. Spray with olive oil and bake in 400 degree oven for 20 minutes. Flip over, spray other side with olive oil and bake for another 10 minutes. 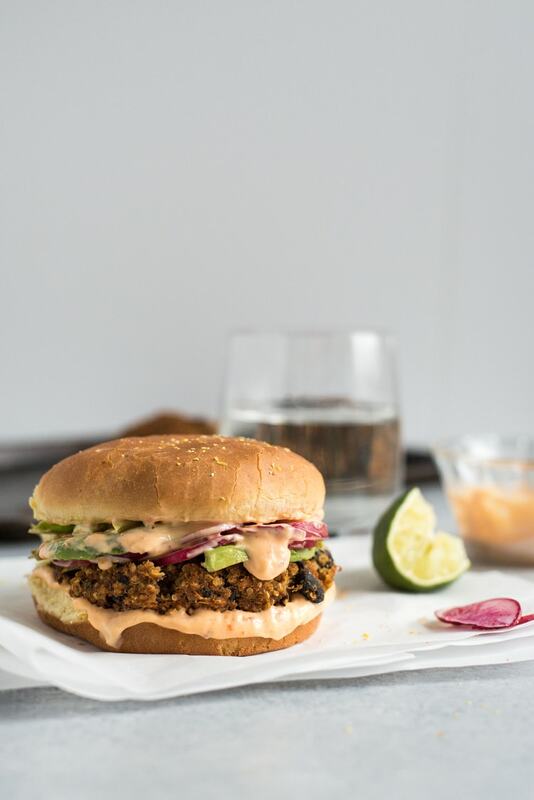 To make the recipe vegan friendly, substitute vegan mayonnaise in the chili lime mayo. Nutritional information is only for the Sweet Potato Black Bean Burger patties. I loved this recipe! Instead of quinoa, I used a mix of almond flour and flaxseed meal; I eat very few grains. I will definitely make these burgers often. Thank you so much! My husband and I are trying to go meatless for a bit, so I’ve been stocking up on vegetarian recipes lately. I made these the other night and they are amazing! Full of flavor and filling. I’ve also found that eating a leftover patty with a fried egg on top makes for a yummy breakfast! (Obviously not vegan, but delicious if you eat eggs)! I just finished making this dish and I absolutely love it! They were falling apart when I tried cooking on a skillet. When I noticed they were not going to stay together, I added flax seed to the rest of the mix and baked them instead. The baking (in my own opinion) was much better and I did not have to use any oil as I baked them on parchment paper. They stayed together after adding the flax seed and tested this by baking the non-flax seed patties in the oven as well (they were still crumbly after coming out of the oven). Overall they taste amazing and I recommend adding some flax to ensure the patties stay together. Thanks for the feedback! I’m so happy you liked them. I’m going to try making these again very soon and try to test them a few different ways to see what I can add so they hold up a little better. These were very good! I added an egg as a binder and made my own spice blend but the recipe was completely inspired by yours and we thoroughly enjoyed them! Thanks so much. I added a bit of ground flax to get it to stick better and some tapioca starch for a bit more crisp but otherwise these were delish! Three of my fav foods! I liked the idea of the ground flax, and we all Loved the recipe!! I made those the other day and they are absolutely delicious! The only reason I didn’t give them 5 stars is because they don’t hold up together very well. I love them cold too and they do hold together better when cold but once they are warmed they fall apart. Any suggestions to make them a firmer pattie would be appreciated since I plan to make these over and over again! Thanks, Diane! I’m so glad you liked them. I’m going to try to remake these soon and see if I can get them to hold together better. As of now, I’m not quite sure. I saw similar comments about the burgers falling apart so I added another can of black beans and they turned out beautifully!! I used a metal spatula to turn them and made sure it was clean each time I turned a patty. Originally the mixture was too moist but the extra beans made it drier and helped bind it all together. Problem solved! Thanks for sharing, Mary! This is super helpful! I’ve made this recipe a few times and it is now one of my favorites. My cousin requests that I make these every time he comes over for dinner. I like to make an avocado mash to spread on the bun and I caramelize onions with cilantro lime rice as a side. Thanks, Isabel! Is there a recommendation on how to properly grill these? Ive made these all the time in the oven and they’re great but i wanted to make them on my grill for 4th of July next week! Maybe you can place foil on the grill and use a non stick spray. These are soooo good. I made them for meal prep to take for dinner for work. I decided to try 1 before I put them away but I don’t have any buns. Put a burger in some romaine lettuce with the mayo and sliced tomato and it was really flavorful. Definitely going to add some red onions like some suggested above. So glad to find a vegetarian option for my meal prep. I’m getting bold and making these into “nuggets” for my toddler. For hers I’m going to mix in a little chihuahua cheese. She’ll eat anything with black beans, sweet potatoes and cheese! Love how easy and inexpensive this recipe is! Oooh, I LOVE that idea! I’m going to have to try it myself!